It’s World Book Day today, and oh! What a day! But the fights you will have about what to dress up as today… | An alien voice under a duvet of dreams. 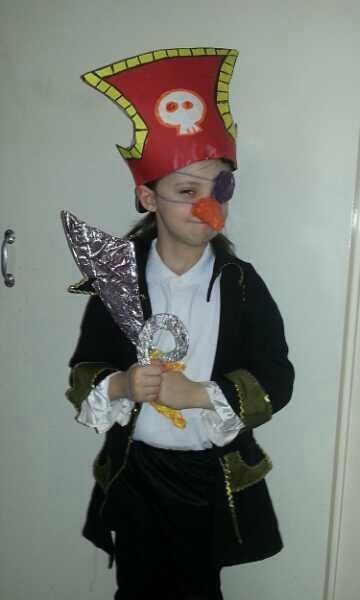 Posted by phoenixaeon in Children's Literature, Costumes, Creativity, Parenting, Pirate Penguin, The Principessa Files, World Book Day. The letter came home on Monday. Your child can come into school dressed up as their favourite character from a book. I dread these words every year. What is she going to choose this year? Please make it simple. But no. Gone are the days where she wanted to dress up as Lola from Charlie and Lola. She flat out refused to go in as Solstice from The Raven Mysteries. “How about Edgar the Raven instead?” But she’d done that one already and lost the beak from last year’s costume. Matilda was mentioned, but quickly binned. No. There was only one clear winner. Only one character that would cut the mustard. The search was initiated for Princi’s pirate costume. The hat was a no-go: wrong shape, wrong colour. The hook-hand was broken. The cutlass was lost. Fab. All we had was the jacket and pants. Yarg! Scurvy seadogs! Thankfully, my very arty cousin visited last night, so we spent a couple of hours working out how to transform a Princi into a Pirate Penguin. Princi Pirate Penguin! Yarg, me hearties!